The Apple Watch may emerge in a cloud of narcotic pixie dust on March 9, but the Swiss watch industry has some fancy new tricks of its own. 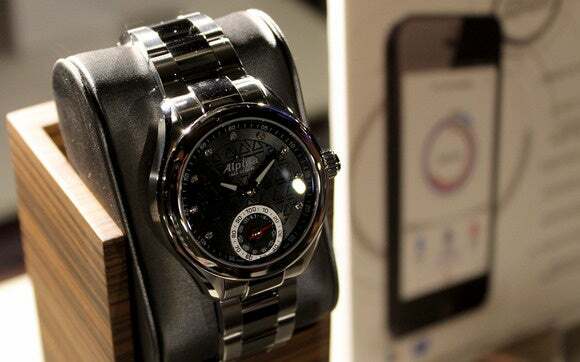 At a chi-chi Thursday launch event, a trio of unbearably urbane manufacturers revealed MMT (Manufacture Modules Technologies), a platform that will power what the Swiss call “horological smartwatches”—beautiful, analog-display timepieces loaded with the same activity-tracking features offered by the Jawbone UP. 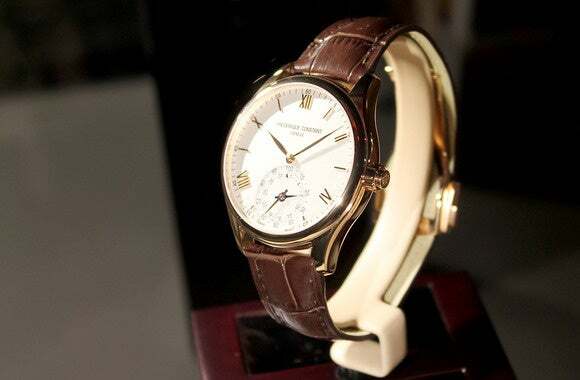 The first brands to sign on are Frederique Constant (maker of luxury-oozing “executive” watches), Alpina (think techy-looking sports watches), and Mondaine (best known for its iconic Official Swiss Railway watch). The watches themselves look stunning, at least compared to the gadgety, LCD-display stylings that we’ve seen so far from Samsung, Pebble, and yes, even Apple. Based on the new MMT platform powered by MotionX activity-tracking algorithms, this Frederique Constant watch looks great and tracks steps and sleep as well. Expect more than 10 horological smartwatch models for both men and women to begin arriving in June. 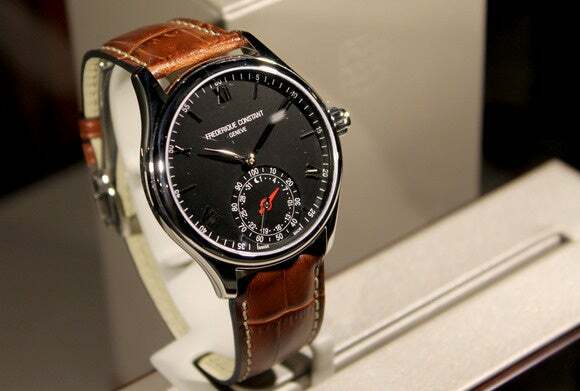 The manufacturers didn't share pricing, but Mondaine already sells designs for under $200, while Frederique Constant watches drift into the multiple thousands. Notably, these designs might undercut Apple Watch pricing. Imagine that. MMT will manage the PCB design, firmware upgrades, smartphone apps and cloud infrastructure for its oh-so-tony partners, letting the watch manufacturers focus on pure analog design. The first wave of smartwatches promise more than two years of battery life; automatic time adjustments as you bop through time zones; and much of the MotionX activity tracking that will be familiar to Jawbone UP users. This includes sleep tracking, step tracking, and signals to prod you into activity if you remain sedentary for too long. 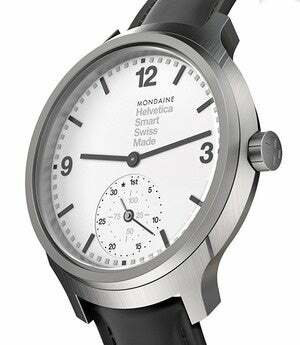 Mondaine didn't have smartwatches at the event, but look at this press shot of Helvetica model. The story behind the story: With Apple Watch on the horizon and being heralded as the tech industry’s best bet to take smartwatches mainstream, the proud Swiss warhorses are finally taking notice. This time last year, a trio of luxury brands told me they had smartwatches in their peripheral vision, but didn’t feel the available tech jibed with brand values. 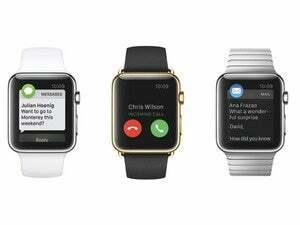 Their main objection: Devoid of hand-crafted analog hands and dials, smartwatches look like crap. They also needed a solution for battery life. Well, the “horological smartwatch” addresses these two problems, and here we are. You can have at least a semblance of smart features without giving up your Grey Poupon. OK, but how do these really work? The MMT presentation was heavy on insouciant grace but light on techy details. The grand reveal started with a beautiful Stradivarius violin recital (because, you know, craftsmanship), and then the Swiss regaled us in stories about why luxury timepieces move human emotion. But the tech itself? Here’s what I know. At the bottom of every horological smartwatch, a dial shows your progress toward a step goal and the algorithmically determined efficiency of the previous night’s sleep. You press the watch’s crown to shift between modes and to start sleep tracking. The U.I looks gorgeous (I love my handcrafted dials), but it also appears rather inscrutable and fiddly, especially because a single dial has to serve both daytime and nighttime activity tracking. During the presentation, Philippe Kahn, founder of Fullpower-MotionX, had trouble explaining the user experience in clear terms. Alpina is looking incredibly butch here, but also promises models for women. Luckily, it appears deep activity-tracking data is provided in iOS and Android mobile apps. So, for example, while the watches themselves will only reveal activity goal progress, the apps (each customized for the different watch brands) should show your actual step counts. The watches connect to phones over Bluetooth, yet the Swiss promise more than two years of battery life. That’s a far cry better than the Withings Activité, a similar concept. MMT says the platform is upgradeable, both through firmware updates and via the replacement of a physical module—something you’d do every two years when you service your watch for battery replacement or a mechanical tune-up. If you want to use multiple watch models from the same company, all should play nicely with a single app install (critical if you want a single, consistent data set). These Mondaine app renderings should give you an idea of the fuller activity data sets available. Could an update add actual smartphone notifications, which are such a critical element of the Apple Watch and Android Wear story? The Swiss didn’t say. 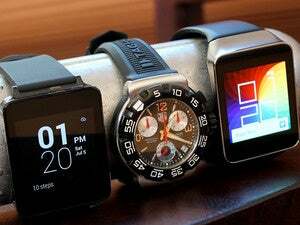 But look at the watch faces in this article. Can you see a way to share meaningful notifications on these screens? They would probably have to be communicated via the simple vibration motors integrated into each watch. Only time (oof!) will tell. As a committed analog watch guy I’m jazzed to see what will come of the new MMT platform. I love Android Wear and I’m excited to see what the Apple Watch will deliver. But I also share the thoughts of TAG Heuer CEO Staphane Linder, who told me that we love luxury watches because “you can feel the hand of people in it.” The new horological smartwatch certainly delivers on that hand-crafted, mechanical, luxury promise, but MMT also looks incredibly light on actual smart features. Notifications are a pretty big deal. But, hey, if nothing else, I might be compelled to ditch my Jawbone UP.